Fall is in the air! Trees are turning red, orange and yellow as frost turns our cheeks and noses a bright pink. There is a nip in the air. Colorful sweaters, hats and mittens begin to appear. Wait a minute! We live in Arizona! True, the temperatures have left the 110s but there is no need for warm clothing, Palm tree fronds may turn brown but never bright colors. Where is our fall? The only way we know fall is coming is when as robins and sparrows fly south, so do our SunBird snowbird neighbors. We welcome friends as we see more and more return to SunBird from colder northern areas. A lot of things have changed in our library. We have several new library volunteers that we would like you to meet. Take a look around for the many donations of books and puzzles that we received over the summer. Since we now have a new swimming pool area we plead that you don’t try to swim with your favorite book. Please try to keep our valuable donations away from water and your darling pets. 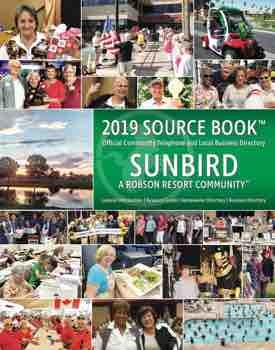 Yes, fall is in the air but at SunBird we look upon it as a time to read outside on the patio now that the temperatures are dropping into the double digits. We welcome you to come to the SunBird Library. Just grab a few books (remember our five book limit) or a jigsaw puzzle, sit on the patio and enjoy your warm Arizona fall!